Aden + Anais' Disney Baby Collection is truly something magical, with each piece embellished with beautiful illustrative prints of our favourite Disney friends, that will meld seamlessly in to any décor. 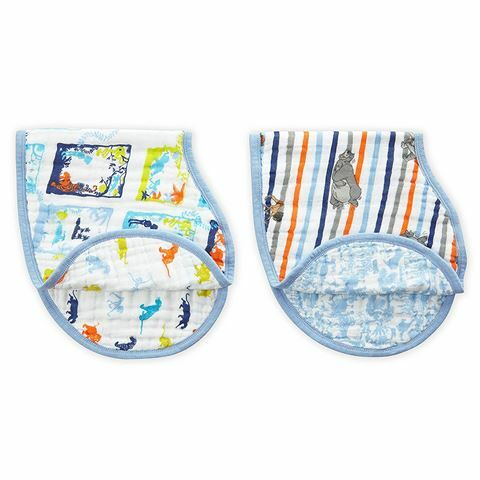 The Jungle Book Burpy Bib boasts a generous size to drape over your baby’s shoulders, their special shape allows them to double as no-slip burping cloths post-dinner. Snapping into place with buttons, they’re easy to fit and (of course) made from cotton muslin adorned with whimsical vignettes from The Jungle Book. Large size keeps you and your baby clean. Unique shape allows the bib to double as a burp cloth, easily draping over your shoulder.